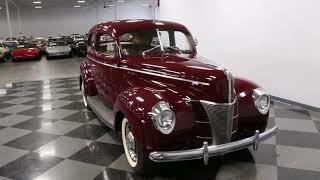 Hi, I am interested in your 1940 Ford Deluxe (stock #4617-CHA) listed on Autotrader for $24,995. I'd like to get more information about this vehicle and confirm its availability. The 1940 Ford Deluxe Sedan is a true pre-WWII icon. With flathead V8 power and a sleek style, they are a true treat. So as you look over all the details on this quite correct example, you soon realize how much nostalgia it packs for quite an obtainable price. There was an investment in the burgundy paint, and it suites this two-door sedan perfectly. Its a sophisticated hue for a dignified classic. Plus, the high level of gloss lets the shine roll evenly off of some of our favorite elements, like the large fenders, tall roof, and aerodynamic rear. This had some absolutely terrific bright work with the pointed grille, artful headlight surrounds, and the rounded bumpers with intricate detail work. Plus, the way the side trim runs from head to tail like an unbroken line tell you about the quality of the body. And we especially love the correct two-piece Ford Deluxe wheel covers with details like the color-matched steel wheels and whitewall tires. Inside there was an investment while retaining the original style. The exterior burgundy returns on the metal parts, and no its joined by a comfortable tan on the seats, door panels, and carpeting. We like the classic texture of the cloth seat, and you can feel the investment simply because something that was nearly 80 years-old could never be this comfortable. This is a true vintage experience with the correct Deluxe-style gauges, art deco dash, and even the clock was correctly repaired. The dual spoke steering wheel retains the groves of its lifetime, so you can feel the generations of drivers that came before you. Theres just something great about the appearance of Fords Flathead V8. The parallel radiator piping gives this motor a very powerful presentation. It has been serviced correctly - including a new water pump, electrical work, belt, solenoid, and much more in 2017 (call for all the details.) And yes, this has been converted to 12 volts and an alternator for easy driving in modern times. While we know you wont be using this Ford as a hot rod, the glasspack-style dual exhaust and column-shifted three-speed manual really let you understand the full power behind this V8. This classic 40 Ford makes every day behind the wheel feel like Sunday. So dont miss out on a great classic. Call today!